How long would you keep searching? 1993. A trip to the cinema turns into a nightmare for Anna and her little sister Jessica when two men throw thirteen-year-old Jessica into the back of a van and speed away. The years tick by... Tick, tick... The police fail to find Jessica and her name fades from the public consciousness... Tick, tick... But every time Anna closes her eyes she's back in that terrible moment, lurching towards Jessica, grabbing for her. So close. So agonisingly close... Tick, tick... Now in her thirties, Anna has no career, no relationship, no children. She's consumed by one purpose – finding Jessica, dead or alive. DI Jim Monahan has a little black book with forty-two names in it. Jim's determined to put every one of those names behind bars, but his investigation is going nowhere fast. Then a twenty-year-old clue brings Jim and Anna together in search of a shadowy figure known as Spider. Who is Spider? Where is Spider? Does Spider have the answers they want? The only thing Jim and Anna know is that the victims Spider entices into his web have a habit of ending up missing or dead. 'One of the most powerful, disturbing, but brilliantly written books I've ever had the privilege to read' Breakaway Reviewers. 'Breath-taking. This really is a fantastic crime thriller' Atticus Finch, Top 500 Amazon reviewer. 'Fast-paced, thoroughly researched, and heart-breaking' CrimeSquad. PRAISE FOR THE STEEL CITY THRILLERS: 'An absolutely fantastic read ... I will definitely look forward to the next one' BestCrimeBooks.co.uk. 'A tough case for DI Jim Monahan ... demonstrating Cheetham's gritty authority in a novel that grips the reader by the throat' Good Books Guide. 3.0 out of 5 starsNo for the faint hearted. 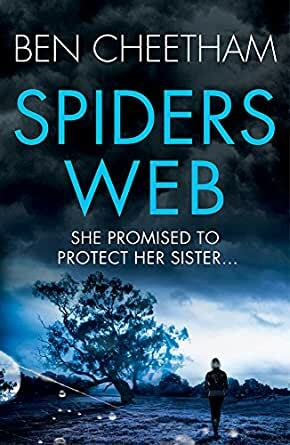 Although child abuse of any kind is not a subject I enjoy reading about, "The spider's Web", written Ben Cheetham, is a fast moving story, well written and I managed to follow it to conclusion. I would like to read something else by this author , but not about child abuse. Entertaining, believable and good plot. Good old detective story where the good guys win against the odds. Will keep you entertained. There is one thing that continually upsets me is that authors and scriptwriters push the trope that cops and people generally don't care about "hookers". 25 years in the police and a lot of that as a detective and I have never ever come across that attitude. I guess it helps to have reasons that the police or the police hierarchy don't care about a death or a disappearance in order to get the hero into the story or to put extra pressure on the hero cop. However I wish authors could come up with something other than this idea. A thriller in which the suspense was maintained at a high level from start to finish. The murderer's identity remained a mystery till the end. 5.0 out of 5 starsBrilliant. Excellent and real. Kept me reading to the very last. Well written and realistic. Excellent plot with great twists and turns. Cheetham just top my list for best thriller I will be reading the others. The one man hero odyssey got a trifle unbelievable, but quite an engrossing book. The style is just like the original, excellent.